Until now, if you wanted custom fitted earphones, your choices were limited to either buying expensive lab made musician monitors, or buying expensive lab made custom molds that are made to fit your earphones. Then, if you changed to a new set of earphones, you get to buy a new set of molds as well. With the EZ Form Kit, you can quickly and easily make a set of custom earphone molds for your new buds or in-ear phones for less than 10 bucks! 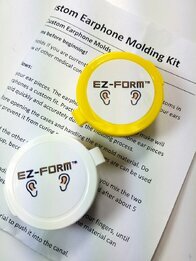 Making your custom earphone molds is simple, quick, and easy. You mix a two part material, put the material in your ears, insert your earphones, then let the material set up for a few minutes. Remove the molds, drill a sound hole and you are done. Each kit includes enough two-part vinylpolysiloxane (VPS) material to make one pair of custom earphone molds and detailed instructions. NOTE: Because there are many variables, we cannot guarantee your results, and refunds for the kit are not available other than for a completely new and unused kit, for which returns are made subject to our normal returns policies.